The 2018 CSC Optimist Championship Silver Fleet got off to a flying start today, as 79 sailors battled it out at loyang basin over 4 races. 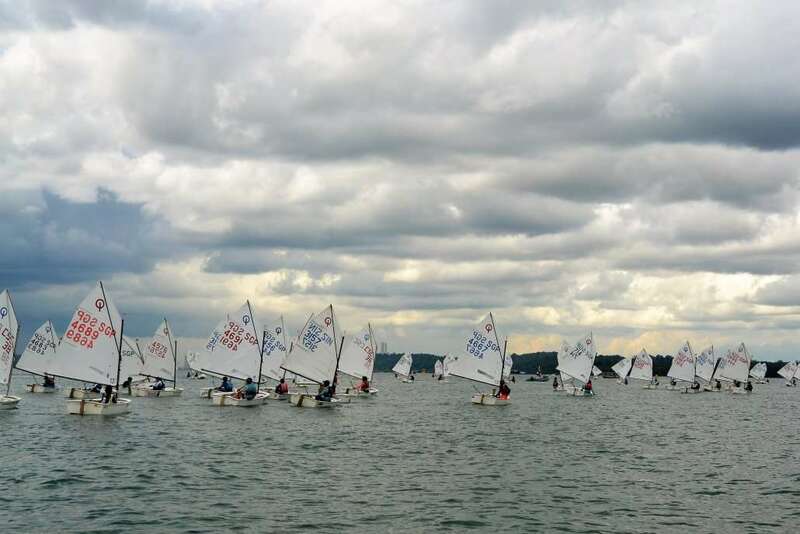 Changi Sailing Club fields their biggest squad ever with a total of 16 sailors racing in the Silver Fleet. 13 of the 16 sailors were sailing in their maiden ranking event – what better way to do it than on home ground! The wind conditions reflected the prevailing weather forecast for this time of the year, a persistent incoming north-easterly breeze coupled with occasional showers. Strong outgoing tides and a careless fleet meant that there was a large number of BFDs in Race 2, totaling 13 sailors. Caden Tan emerged tops after day 1, leading the fleet after 4 races, scoring 2 bullets in Race 1 & 2 with a total of 7 points. The chasing pack is another large contingent of SAFYC sailors from 2nd to 6th, all boasting consistent top 20 results. Further down the standings, Our best performing CSC sailor Angyal Chew sits in 23rd, an amazing result considering this is her first national ranking event! Scoring her best finish of 11th in Race 2, this should be a big encouragement for her to continue doing her best over the remaining 2 days. The rest of the CSC squad are not far behind, Yohan placing 28th, and Nadia placing 30th to round off the top 30. With 5 races and 2 days to go, anything can happen. But whatever the results, always remember to go out there and enjoy the sailing!